Sahar al-Haideri, killed by insurgents on June 7, used the pen to counter violence and intolerance in Mosul, her home town. 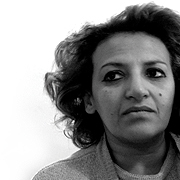 Sahar al-Haideri had to die because she was a journalist - an Iraqi journalist who dared to ask questions, and who gave a voice to Iraqis who do not want their country to be torn apart by sectarian violence or ruled by terror imposed by al-Qaeda’s franchise organisations. Haideri, 45, reported from her home city of Mosul, a troubled place considered Iraq’s second most dangerous location for journalists after Baghdad. Insurgent groups have been pushing at alarming speed to establish an Islamic “emirate” in the northwestern provinces of Anbar and Nineveh, and Mosul would be designated its capital. Haideri was among the first Iraqi journalists to publicise the rise to power of extremists in Mosul. The first story she pitched to IWPR – during a course on how to report women’s issues held in May 2005 – was about insurgents trying to impose Taleban-style restrictions on women in Mosul. She described how female lecturers and civil servants were being targeted and killed. “The intimidation and attacks have forced other women in Mosul to give up going to work,” she wrote. Staying home was not an option she considered for herself. She went where no foreign journalist could go any more – into the streets, shops and restaurants of her volatile city. In the 17 reports and eight radio features that Haideri contributed to IWPR, one common theme stood out – the struggle for control over Mosul, and how this affected its people, and most of all its women. Haideri was a tough reporter but a caring wife and mother of four at the same time. The human touch was never missing from her work. Her stories always reflected this concern for people’s lives – shopkeepers and teachers; mothers, fathers and children; students, hairdressers and janitors. Nor did she shy away from exposing pseudo-Islamic rhetoric and the abuse of religion for the sake of power. In her stories, people dared to speak out against a life on the edge of insanity. “Extremists have started to interfere in all aspects of daily life in Mosul,” she wrote in December 2006, describing how one recent leaflet instructed the owners of clothes stores to cover the heads of shopfront manikins for the sake of decency. Haideri did not want to be told what she must or must not write. Her way of dealing with increasingly dreadful realities was to pitch more and more stories. It was almost as if she could counter the trend of diminishing hope through her writing, or stop the erosion of social cohesion with her pen. But the logic of those who want Iraq to fail dictates that anything that might give hope must be destroyed. That is the reason that doctors and professors are targeted, and it is also why so many journalists have died – and will continue to die. This intention is sadly confirmed by a statement in which the Ansar al-Sunna group claimed responsibility for ambushing and killing Haideri in Mosul on June 7. The group accused Haideri of collaborating with the “apostate” Iraqi police and government. “After sophisticated monitoring, we concluded that... Haideri was writing false reports about the mujahedin in order to distort the truth,” said the group’s statement. The authenticity of this statement has yet to be verified. Mosul’s deputy police chief had earlier said that Haideri’s name was fourth on a hit-list prepared by the so-called Emir of the Islamic State in Mosul. But whichever group the men waiting for Haideri as she left her house on June 7 belonged to, the message her death is supposed to deliver remains the same - journalists must die because they are allies of the government, the security forces and the “infidels”. The statement purporting to be from the “Islamic State” said that the killers took Haideri’s mobile phone, which was found to contain the telephone numbers of police officers. Of course Haideri had police contacts in her mobile phone, as well as those of officials and politicians. That goes with the job, and is no proof of bias. If any evidence was needed of Haideri’s open-minded approach, her story on the aftermath of a suicide bombing in the border town of Tel Afar provided it. She went there embedded with the Iraqi police, but the story she filed was titled Police Linked to Tel Afar Reprisals. Haideri was aware of the risk her work entailed. Every journalist in Iraq knows he or she might be killed at any moment, and repeated threats are commonplace. Many have fled the country, while some leave temporarily in hope of coming back as soon as the situation improves. In recent years, Haideri published articles under various pseudonyms, and she took every opportunity to leave the city – to attend training courses in Sulaimaniyah or in Amman, or for short trips to Syria. She had already evacuated her family from Mosul. But she always came back. Haideri was highly conflicted about her position - constantly raising concerns about her security and seeking to leave, but continuing to report and write more than ever. It seems her enemies knew the only way to make her quit was to kill her. As we mourn her death, the best tribute we can pay her is to remember that she is not the only one on the hit-list. There are many more journalists in Iraq who need our help if we want them to stand up against those trying to silence them. “May God save female journalists, most of whom work anonymously for fear of being killed for no other crime than telling the truth,” Haideri said in remarks that went out on IWPR’s radio show The Other Half. Iraqi journalists need more support of a worldly nature, too. Susanne Fischer is IWPR Iraq country director. She first met Sahar al-Haideri when conducting a training course in Sulaimaniyah in May 2005. This article has been produced with support from the International Republican Institute (IRI).